Makhana, Euryale ferox (Nymphaeaceae) is a perennial aquatic herb with gigantic floating leaves that grows in still shallow water. 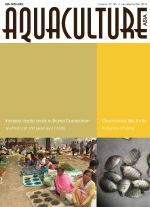 In India, makhana is particularly reported in north Bihar and lower Assam and the distribution, existence and potential of makhana in Assam is fragmentary as the aquatic cash crop grows wild in the state and is rarely cultivated in water bodies. The sowing and harvesting of makhana seeds is conducted by groups of migratory people belonging to the Mallah or Sahini community of Bihar. Harvesting is quite a cumbersome task and requires skill. The makhana seeds are usually fallen and scattered over the bottom of the wetlands (beels) and must be collected manually by diving during the month of September-November. The presence of makhana in the beels can be easily identified by its gigantic prickly floating leaves, which are green on the upper side and purple to red on the lower, thorny, oval or rounded with a diameter of 0.2-1.3 m. Once a suitable location is confirmed, two persons among a group of 10-12 stay on the boat while the rest of the harvesters dive into the water to collect the seeds. There is no established record on the economics of the makhana crop in Assam, but the raw seeds sell for Rs. 60-70 per kg in Assam. Myriad beels of various dimensions are scattered throughout the lower part of Assam that are suitable for stocking and rearing useful aquatic flora and fauna of high economic importance under controlled conditions. The general people of Assam are largely unaware of the nutritious use of makhana seeds as relished by people in other parts of India and abroad as food items or for medicinal use. However, the raw edible part of the seeds are eaten by rural folk in interior villages as a casual food.